Silver's many roles included playing consultant Bruno Gianelli in "The West Wing"
NEW YORK (CNN) -- Actor and political activist Ron Silver, who played a recurring role in TV's presidential drama "The West Wing," and who also let his political views play out in real life, died Sunday after a two-year battle with esophageal cancer, according to a colleague. 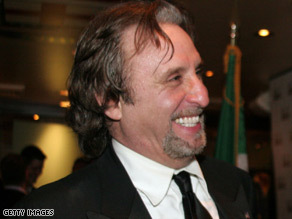 Ron Silver is seen in this 2006 photograph. He had a recurring role in TV's "The West Wing." Robin L. Bronk, executive director of The Creative Coalition, said Silver, a New York native, died in his sleep with his family around him. "Nothing could hold Ron back, not even a debilitating illness. His contributions as an artist and activist will never be forgotten," said Bronk, who runs an organization founded in 1989 by Silver, actor Christopher Reeve and other prominent figures in the arts as a political advocacy organization for the entertainment industry. Silver's politics moved from working for the Democratic Party and its candidates for most of his life to becoming a supporter of many Republican candidates and causes, with the shift occurring after the 9/11 terrorist attacks. He was quoted as saying the terrorist attacks and the Democratic Party's policies regarding terrorism had persuaded him to become a political independent. He backed then-President George W. Bush for a second term in 2004, and he spoke at the 2004 Republican National Convention in New York. One of Silver's final television appearances was on CNN's "Larry King Live" last October, when he was part of panel discussing Sen. John McCain's campaign against then-candidate Barack Obama. Asked by King about rifts within the Republican Party as the election neared and the country's financial crisis worsened, Silver said, "The Republican Party, if they are out of power for a while, needs to regroup and rethink who they are as a party. This deregulation, this whole Reagan Revolution, did not seem to work in this crisis." Silver's many roles included playing political consultant Bruno Gianelli in "The West Wing," and attorney Alan Dershowitz in the movie "Reversal of Fortune."